Situated just on the outskirts of Campos, this attractive villa is set in a peaceful and rural location. 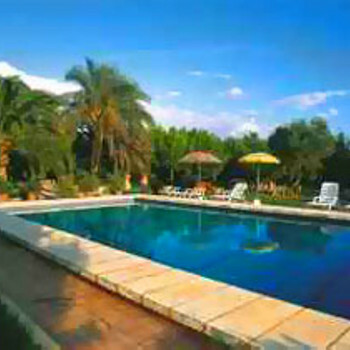 It has beautifully kept gardens letting you take full advantage of relaxing by the pool. A beautiful self catering villa, the pictures on the net do not do this wonderful place justice at all. It has been vastly improved. Great big clean pool all to yourself! Really quiet location if you just want to relax and forget the world this place is for you. With lovely baby peacocks running around. The farm is in your back garden, so perfect for animal lovers but it does not smell and is not really noisy execpt for the chickens in the morning! Beautiful gardens with lemons, oranges, limes and chilli growing to make your bbq go down a treat and a really welcomed starter food pack for when you arrive at night. Note the big local supermarket is shut on a Sunday but you can buy supplied from the garage.